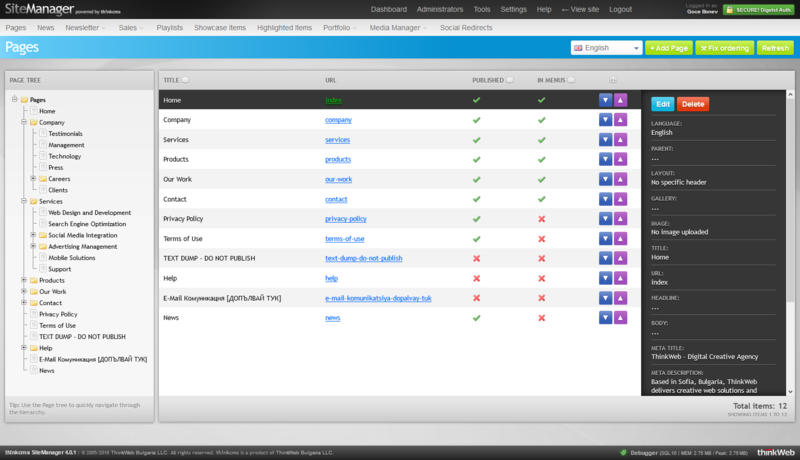 ThinkCMS version 4 was released in early 2013 and was a big improvement over the v3. The fourth version introduced a lot of new features including a hierarchical view of pages and other items that follow a category / sub-category principle. This was the first version to include the newsletter module where admin users could build complex newsletters with drag and drop widgets. PHP 5.3, 5.4, 5.5 and 5.6 are supported (GD graphics support, mb_string functions, PCRE UTF-8, SimpleXML). Other requirements include: Apache 2.x (mod_rewrite, mod_auth_basic, mod_auth_digest, mod_deflate, mod_env, mod_headers). MySQL 5+. This product is no longer supported and will receive security updates until March 20th 2018.